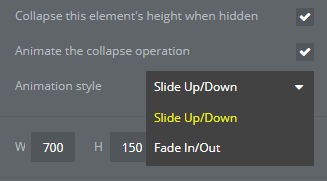 It would be nice to have more group colapse animation options. Also different animations for in and out transitions. Yeah I know I can do this on a workflow level. I agree, it would be nice to have just a few more options build into the elements collapse operations, rather than creating another workflow. But also another neat addition there would be to set the timings on the animations e.g. 250ms - as sometimes I’ve noticed with elements that are very tall, the animation can be a bit too long, so it would be nice to have the ability to tinker with that value.